Please do keep notifications of Men’s Holy League meetings coming; I am happy to promote them both to raise attendance at those already established, and in the hope that it might inspire the creation of more. First at St Hedwig’s Church in Manchester, New Hampshire, July 22nd, at 7 pm; the Facebook page is here. I am particularly enthusiastic about this one because as well as Adoration there is sung Compline. The church is located at is 147 Walnut Street. 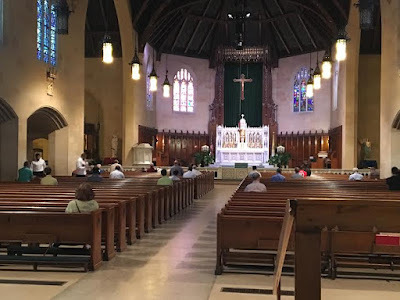 Second at St Isaac Jogues Church at 21100 Madison in St Clair Shores, Michigan; the next meeting will be Saturday August 6th at 7:00 am, with coffee and breakfast afterwards. The organizer tells me that this has grown to an attendance of nearly 60 people in the past year and a half, although he is quick to point out that there is still plenty of room for newcomers. There is also a family Adoration on the third Friday of every month at 6:30 pm followed by fellowship (and ice cream!). For more information go to the website or call the pastor, Fr. Darrell Roman, or his associate, Fr. Brian Shackett, at 586-778-5100. 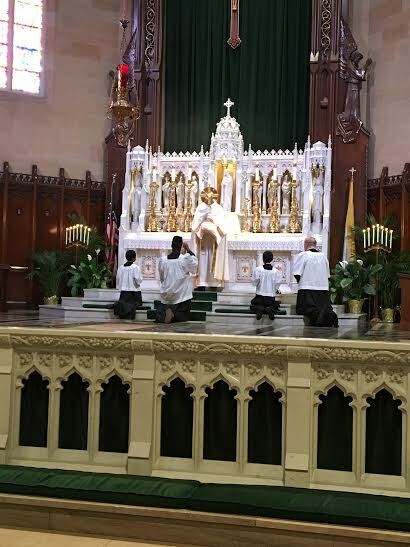 Thanks to David Schuster, who sent me these photographs of the recent Holy League Holy Hour at Assumption Grotto in Detroit, Michigan. He told me that the numbers are higher than these photos suggest and about 60 men turned up. Created with the patronage of Cardinal Burke, it is a new, parish-based network of men inspired by the original Holy League of the 16th century, which by prayer and fasting, implored the help of God’s grace, and the intercession of His Holy Mother. By the grace of Almighty God, on October 7, 1571, at the Battle of Lepanto, the Christian fleet won a crushing naval victory over the Ottoman Turks, saving Christendom and western civilization.